If the foundation is strong and firm, no matter how many floors are constructed above it, the building will remain intact and strengthening. Similarly the valuable Vedas are the base of knowledge and is the mirror of all education. People might say that the generations today believe on scientific revelations and rational thoughts of school, yea we agree to it but the eternal truth remains significant forever. Our scientific and technological progress may be huge, but the bases of knowledge have been received from our holy Vedas and will act as a guiding torch for many more generations, yet to come. Hoping for community welfare rather than individual gain has always been the message. If every individual holds the perspective of viewing One eternal power within every being than most of the issues will automatically be resolved. The act of Universal brotherhood is an immediate necessity for regaining the peace and humanity on this planet. The name may be different but the ultimate source is One. Vedas reveal the omnipresent, omniscient and omnipotent traits of the powerful energy. He is one utmost source who is formless and eternal. He was, is and will forever be. Becoming aware with this universal truth and accepting His presence each moment makes the being fearless and inculcates the deep faith on His presence. Just like a candle brightens the entire room, similarly the enlightened soul gives direction to the mind and body. God, soul and matter-always exist; weapon cannot cut it, fire cannot burn it, water cannot spoil it, and air cannot dry it. As the soul keeps on changing the outer physical appearance, but its original traits remains constant. If each one of us comprehends this enlightening truth, then there will be no differentiation on the basis of caste, creed, colour, appearance, religion and so on. Vedic thought holds that the best instrument of knowledge is the silent mind. As per the Vedic sciences, serene and pure mind is capable of going beyond name, form, number, time, place and person or it would just be another object or entity in the outer world. This shows that there is much above physical reality and the appropriate instrument for knowing the universal Being is not a limited instrument which looks externally, like a telescope, but the silent mind that is able to see within. Vedas has a commendable source of knowledge, which is relevant for ages. Even the earlier misconceptions about ghosts, occult powers and man worshipping every creature out of fear; the turmoil was eliminated with the rational Vedic sciences. Still the presence of evil energies is dominant over the planet but the blinds can be removed by the light of knowledge-Brahma. The presence of fake gurus may dispel us from the path of spirituality but we have to be cautious and aware. In the Vedic sciences, human well-being is defined as the harmony of body, mind, prana and soul (Atman or Purusha). The natural healing process by recognising the underlying vital energies is the secret to well-being. Today we might have advanced in medical sciences, but the bases lies in the Vedas and holds all the thoughts behind the cosmic life force of development. Organic and natural systems of progress or healing are far better than the artificial processes. Jyotish or Vedic astrology is aimed at helping us understand how the various matter of the Universe i.e. the lights of the stars and planets affects our own bodies and minds and the fate of our world as a whole. It comprehends the knowledge of karmic influences on us, and how the heavenly bodies have their varied effects. Few might say that astrology is illogical but still few of the actions that go beyond expressions and understanding become a part of new physics. If we recognize that the universe is pervaded by consciousness, we can recognize that light ultimately is a power of consciousness, which means that astronomy must recognize astrology. The ultimate unity of science and spirituality through Vedas can act as a guiding torch for achieving the ultimate destination of supreme truth. By learning the secrets of Vedas, we can enhance our art of living and improve our lives as per the supreme fathers wish. This entry was posted in Astrology, Puja and tagged ancestors, astrology, astronomy, ayurveda, blessings, Brahma, daily lives, delusions, divine, enlightenment, environment, eternal, faith, formless, generations, Guru, happiness, have a little faith, Hindu, hinduism, knowledge, love, omnipotent, omnipresent, omniscient, oneness, path of enlightenment, physics, relevance, Scientific, shubhpuja, shubhpuja.com, significance for present age, spirituality, supreme Father, technique to live, Universal brotherhood, universe, Vedas, vedic astrology. Relationships are a precious gift that makes you feel special and loved in this world. The feeling of ‘Vasudev Kutumbakam’ is realized when the bonds of selfless love are nurtured and provides a reason to survive in this world. To cherish the connecting bond with our soul and the supreme Universe, become a part of the Indian traditional festivals. Here are few highlighting facts about Bhai-dooj. 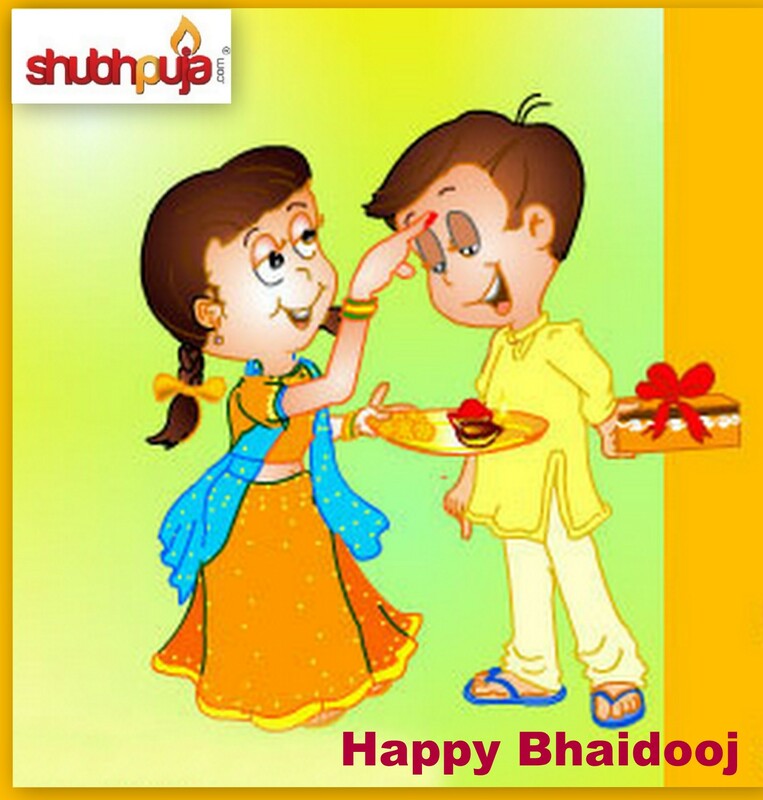 Bhai Dooj is referred by various names depending upon the states. Like Bhai Phota in Bengal, Bhai Tika in Nepal, Ningol Chakuba in Manipur, Yama Dwiteya in Orissa and Bhau beej in Maharashtra, Karnataka and Goa. Bhai means ‘brother’ and Dooj means ‘second day after new moon’; so it is celebrated two days after Deepawali during the Shukla Paksh of Kartik month. The pious festival involves the applying of vermillion on brother’s forehead by revering the beautiful bond between brothers and sisters. To cherish the eternal knot between siblings, they exchange gifts and feasts are organized among family members. On this day, Lord Yama visited Yami and she greeted her by applying a vermillion mark on his forehead and praying for his longevity and well-being. Subhadra welcomed Lord Krishna by applying tilak on his forehead, when he reached home after defeating devil Naraksura. King Nandivardhan (brother of Lord Mahavira) was soothed by his sister Sudarshana, when Lord Mahavira attained nirvana. This day is the cultural representation of Indian culture where men and women clad in the best ethnic and elegant attires. Fasts is observed by the sisters till they apply tilak on their brother’s forehead and later they enjoy the lavish treat together. The post Diwali celebration of the five day festival is completed on a happy note and glorifies the eternal love of siblings and families. This entry was posted in Puja and tagged attires, auspicious, bhai dooj, Bhai phota, bhaiya dooj, blessings, blissful, book now, brother, celebration, culture, devil, dharma, divine, diwali, environment, eternal, ethnic, facts, faith, family, Festival, food, forehead, fortune, gifts, glory, grace, happiness, happy, have a little faith, lavish, Lord Krishna, Lord Yama, love, Nandivardhan, new moon, pooja, puja package, rejoice, relations, Science, second, shubhpuja, shubhpuja.com, siblings, sisters, subhadra, Sudarshana, tika, tilak'vermillion, traditional, traditions, Yami.